This is a video that’s from maybe 2.5 or 3 years ago as Zoey blows bubbles. 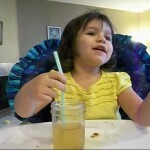 Little Z has always loved to sit at the kitchen island, and this time she had some watered down iced tea. She has always been partial to straws too, and finally discovered what we all do when we’re little, blowing bubbles. Still to this day we keep a stash of straws here for her just for her drinking pleasure, lol. I remember doing the bubbles thing with milk, and, oh wow, memory just came back, with those old style paper straws. Remember using those on a milk shake? Pure torture.